Good morning Lemmings – actually no, it’s not ‘good morning Lemmings’ at all and more like ‘Bah. Must we do this Lemmings?’ because for some reason last night’s very ill-tempered episode has left me in a thoroughly unpleasant mood. With this in mind, we’re going to dispense with the usual even-handedness, line the panelists up against a wall and make a series of rash decisions as to who’s to blame for the cloud of animosity that’s currently hovering over me. Ready? Let’s do this. 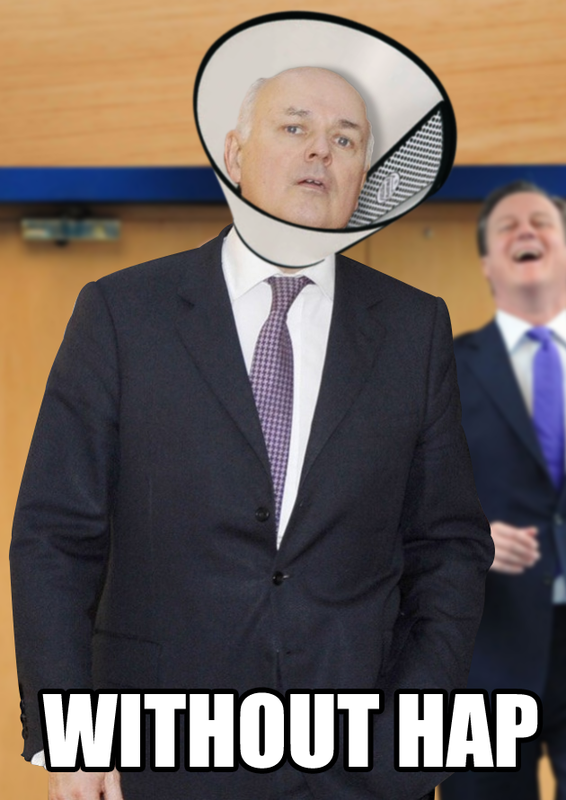 Was it Iain Duncan Smith’s insistence on ruining a perfectly good pshop? …And pretty pleased I was with myself too because it was going to be so easy to fold into the write up: All it would require would be one question about how the Universal Credit programme has gone so spectacularly awry that it’s now been reclassified as a ‘new project’ and that would be it – IDS would put on that face that’s supposed to look ‘appropriately concerned’ but actually comes off as ‘pleading desperately’, Hislop would have a field day and I’d be able to segue into the pshop with a killer line about how the only way you could make him look any more hapless is by sticking one of those dog cones on his head. In fact, so confident was I that this would come to pass that I even had a tweet of the pshop all ready to go during the show, just waiting for his inevitable downfall so that I could press the button and then bask in the satisfaction of all-too-easy victory. But the button was never pressed. And why was the button never pressed? It was never pressed because a) aside from a few reflex jabs from Bryant and Yaqoob, matters relating to the DWP never really came up and b) he emerged from the rolling to-do with Yaqoob (more on that later) looking rather good. True, there were moments where his trademark brand of Trying To Look Very Cross Indeed But Not Quite Getting It Right (“Do me a favour Salma…”) had the potential to go sideways but so busy was the intemperate traffic between the combatants that it never developed into anything truly cringeworthy. 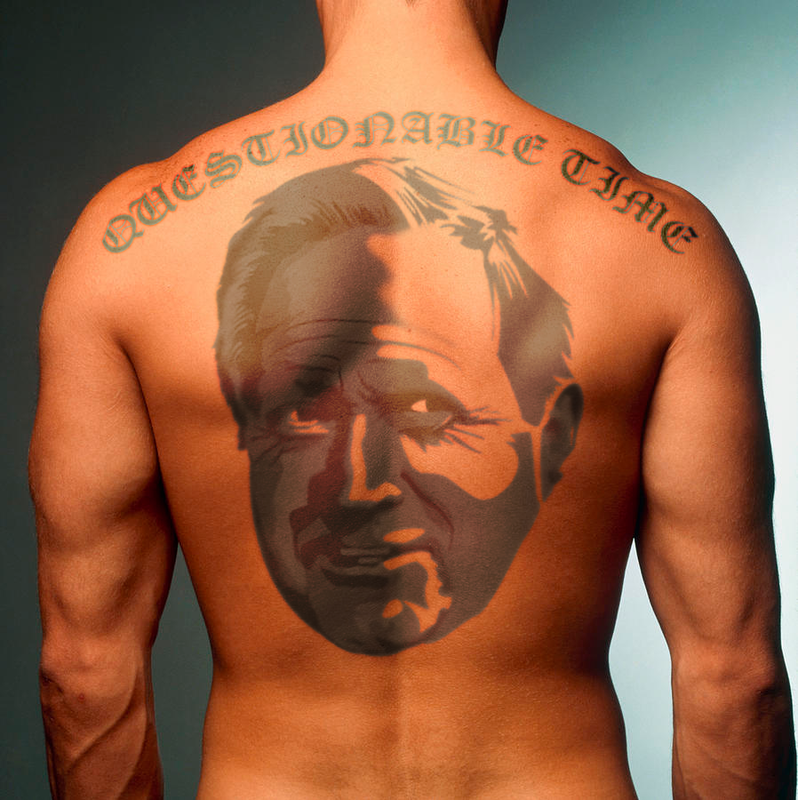 So here I am with a useless pshop, an unslaked thirst for ministerial blood and an embarrassingly abundant clutch of marks for the man in question. Iain Duncan Smith, I find you partially guilty for buggering up my QT experience and hereby sentence you to read your own novel. Right, who’s next in the dock? Was it Salma’s fault or was she stitched up? So Salma ended up in hot water with the rest of the panel last night but I can’t quite fathom whether she was unjustly martyred or the victim of a kerfuffle of her own design. And why can’t I tell? Because I’ve not got a clue what’s going on with this whole Trojan Horse business – not the merest inkling other than it made for an entertaining intra-cabinet spat and that it just won’t get off the bloody news (however it’s worth pointing out that the arrival of Big Brother has once again lead me to surrender custody of the telly to the Frau Ribs so I haven’t had Newsnight to spoon feed me any ready-made opinions). Anyway, it went like this: Salma slightly overplayed her hand on the Iraq question – a forgivable offence since she’s the leader of a party that came into being because of the war – and then went on to defend the schools in the Trojan Horse affair. Now I don’t know if she was right or wrong on this matter as it’s a story that just makes my eyes glaze over but the reaction from the rest of the panel was pretty full on and it wasn’t long before I started to get the feeling that they were ganging up on her. That’s rarely a good look but then again, she was having to defend her point so doggedly that I got the feeling they might actually be on to something. I dunno, it might six-of-one and half-a-dozen-of-the-other but the real problem was that it went on for what seemed like hours and the temperature got so heated that it killed the third question dead in its tracks. Anyone want to talk about British values? No? Shall we just keep shouting at Salma instead? Ok then! Basically, it felt like I was being forced to watch a very long running and involved soap opera that I’d never seen before and to have an opinion on it. For better or worse, right or wrong, I lay the blame for this at Salma’s door and hereby sentence her to a candle lit dinner with George Galloway. Ooph… Rough justice. Was it Tessa Munt’s… very… very… slow… delivery? Initially, yes – it was definitely her…very… very… slow (and rather matronly)… delivery that had me all out of a kilter but I ended up warming to her, mainly because she seems pretty genuine and in it for the right reasons. Granted, ‘genuine’ and ‘the right reasons’ tend not to make for the most electrifying QT performances (for that you want ‘mendacious’ and ‘entirely the wrong reasons’) but I feel that they mitigated some of the grief caused by her rather ponderous vocal stylings. Community Service for you, Munt. 60 hours of coming up with rhyming scores for me and we’ll call it quits. Was it Ian Hislop’s particularly irksome mood? I’m usually a big fan of Hislop on QT but last night he just seemed a little bored and difficult, like he couldn’t really be bothered to play the game. However there are a few things that can be said in his defence, the first being he did make life a little awkward for the rest of the panel and secondly, Private Eye are the only national publication who bother to send out very nice rejection letters – a courtesy that counts for a lot in my book. I think an informal caution is all that’s required here. Was it Chris Bryant’s fault for simply being Chris Bryant? Yes! Probably! I don’t know! He was just as rabid as everyone else but I’ve got a soft spot for him so his sentence will be suspended. Stay out of trouble Chris and I won’t have to repost that photo of you in your pants. 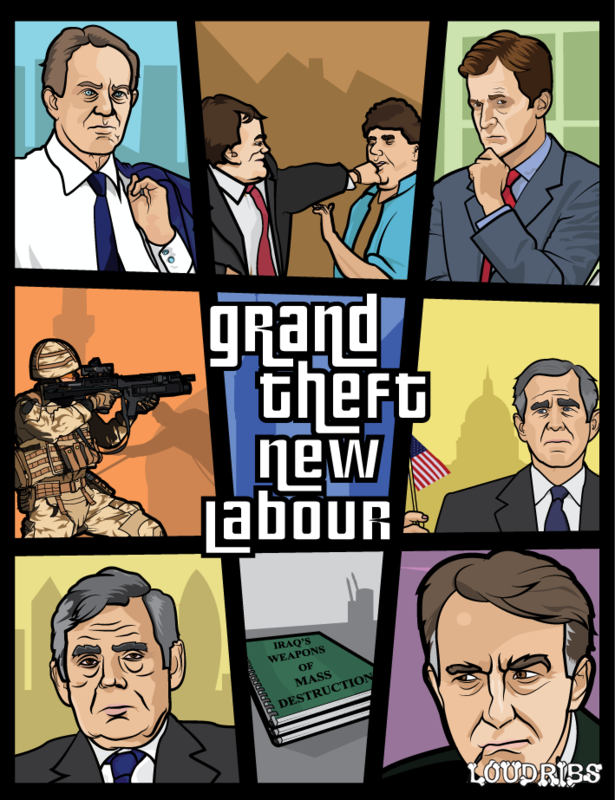 Right, thanks to the footy I’m done for two weeks but should you have money burning a hole in your pocket then please feel free to go and buy this Grand Theft: New Labourt-shirt I designed (and then – in the interests of fairness and all that – go and buy the Grand Theft: Coalition one as well).